Below: This bright red vertical container was a hit. At right, I darkened the photo to make plant IDs, in white letters, stand out, so you can see them better. — See labeled varieties of excellent, readily available varieties on my Cold-Hardy Succulents page. — Growing Succulents in Northerly Climates: Part One of my presentation at the Northwest Flower & Garden Show. See gorgeous new Sempervivum cultivars and inspiring, eye-catching design ideas. — Growing Succulents in Northerly Climates, Part Two of my presentation at the Northwest Flower & Garden Show. More cool succulents for cold climates and how to select, grow and design with them. — Sedum Chicks at the Northwest Flower & Garden Show. Pacific NW designer/grower Becky Sell explains how to select, care for and beautifully combine cold-hardy sedums, semps and other succulents. 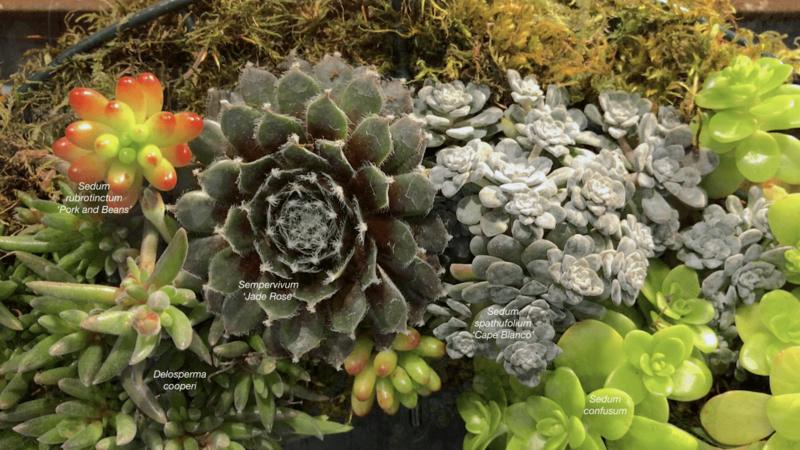 — See the Cold-Climate Succulent Gardens section of Designing with Succulents (2nd ed.). — Find info in all my books about succulents in the genera Sedum, Sempervivum, Delosperma and more. So happy to read about zone 8. I live in Virginia beach which has hot summers and we have a short winter, but we went down to 5 degrees this winter with 11″ snow. I had brought everything inside, but it would be nice to leave some outside. please advise.